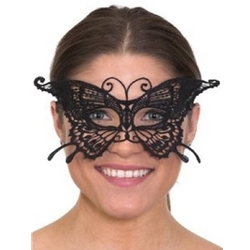 The Butterfly Lace Mask comes in black and is available in One Size Fits Most Adults. This lovely mask is a fantastic finishing touch for a Masquerade, Victorian, or Fairy costume. Perfect for Halloween or for everyday play. Pair with Fairytale Wings, our Velvet Victorian Cape, or our Kids Butterfly Princess Hat to find the look that’s right for you!